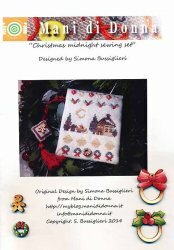 Christmas Midnight Sewing Set [H1562] - $26.00 : Yarn Tree, Your wholesale source for cross stitch supplies. Cross Stitch pattern from Mani di Donna. It's the night before Christmas. Santa's sleigh full of gifts for the children is waiting outside for him. The moon is lighting the midnight sky, as Santa is hurrying to get everything delivered before all the children wake up. Christmas holly, lights & wreaths are stitched above & below. A gingerbread man & wreath embellishments are included with this design. Stitch count is approximately 57W x 73H. Stitch count for the scissor fob is approximately 19W x 19H. Stitch count for the button is approximately 12W x 12H. Stitch count for the scissor pocket is approximately 34W x 36H. Stitch count for the threads pocket is approximately 60W x 36H.